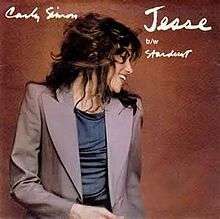 "Jesse" is a song written and performed by Carly Simon and produced by Mike Mainieri. The song was the lead single from Simon's ninth studio album, Come Upstairs. The song is told in first-person about the narrator's disdain for her former lover, Jesse, who has just moved back to town. She vows to have nothing to do with him, "Don't let him near me, don't let him touch me, don't let him please me," she sings. She asks her friends to remind her of how he has wronged her, because she fears she'll end up letting her guard down and fall back under his spell. She ends up going back on her promise to herself and the two rekindle their romance. "Jesse, quick come here, I won't tell a soul", "Jesse, that you've come back to me, my friends will all say 'She's gone again'", she sings. She then seeks to comfort her friends because they don't approve. "My friends, let's comfort them, they're feeling bad, they think I've sunk so low," she sings. Simon's then-husband, James Taylor, and their daughter, Sally Taylor, sing backup vocals. The single has a country-pop flair, unlike the rest of the album, which is more rock oriented. "Jesse" was a major success, staying on the US charts for 6 months; it peaked at number 11 on the Billboard Hot 100 and 8 on the Billboard Adult Contemporary chart. The single was certified Gold by the RIAA, Simon's fourth single to achieve this feat, signifying sales of one million copies in the US. The single was also a hit in Australia, peaking at number 4 on the Kent Music Report, becoming Simon's biggest hit there since "You're So Vain". It also peaked at number 12 in Canada, making it her 11th Top 40 hit there. AllMusic reviewer William Ruhlmann called the track "the album's highlight" and declared it "Simon's best-written pop/rock song since "You're So Vain" and a Top Ten hit to boot." Simon included the single on her compilations Clouds in My Coffee (1995), Anthology (2002), and Reflections (2004). An official music video was not made for the song. Simon has performed it in many of her concerts, including two in which it was filmed: Live at Grand Central in 1995, and A Moonlight Serenade on the Queen Mary 2 in 2005. ↑ SongMeanings.com. "Jesse". Retrieved 29 April 2014. ↑ "Carly Simon - Chart history | Billboard". Billboard.com. Retrieved 2014-04-29. ↑ "Carly Simon certifications". RIAA.com. Retrieved 2014-04-29. ↑ "CAN Charts > Carly Simon". RPM. Retrieved 2015-01-11. ↑ AllMusic. "Come Upstairs". Retrieved 20 May 2014. ↑ "Carly Simon Official Website - Jesse lyrics". Web.archive.org. Archived from the original on April 14, 2005. Retrieved 2014-05-05. ↑ Discogs. "Jesse 7" single". Retrieved 11 January 2015.